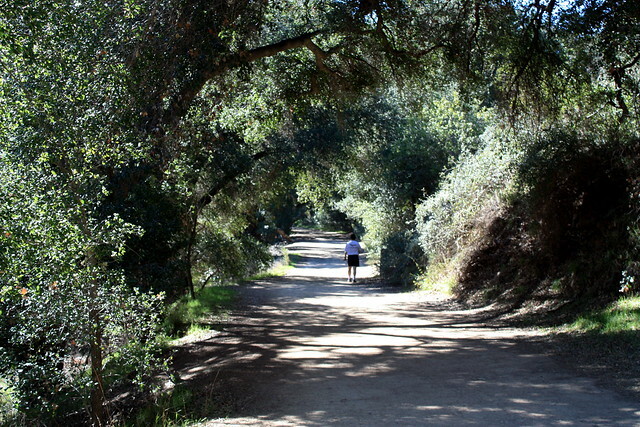 An 8 mile in-and-out, exploring the lower canyon sections of Malibu Creek State Park. 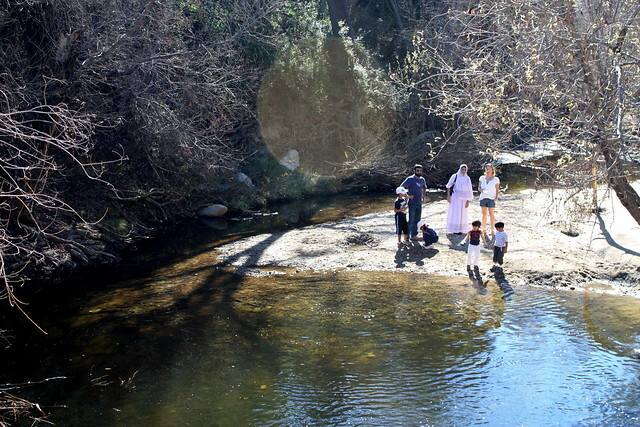 Lots of stream-side scenery, a few man-made lakes, spectacular Santa Monica Mountains scenery, and lots of side-trails make this an excellent area for a day hike or overnight. 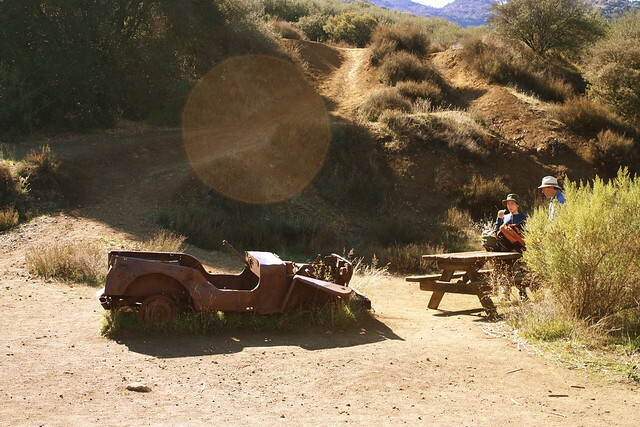 This has been and continues to be a popular place to shoot TV and movies — there are still a few remnants of the old M*A*S*H set here — and the creekside pools and rock formations are popular places for swimming and rock-climbing. 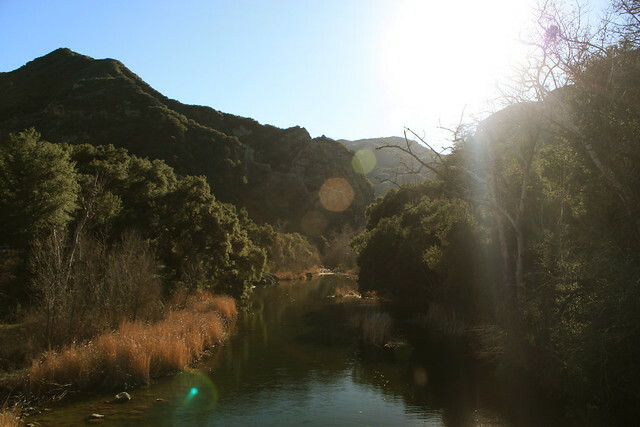 Malibu Creek State Park is a sprawling chunk of parkland in the Santa Monica Mountains, hugging the Malibu Creek as it flows into the ocean, while also stretching east along the Backbone Trail. 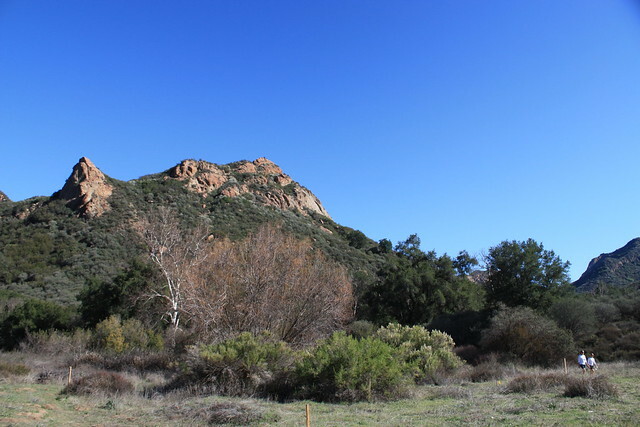 There are several distinct sections of the park, and this write-up roughly covers the “lower canyon” area, along the trails that follow Malibu Creek through a striking section of the mountains known as the Goat Buttes. After driving up Malibu Canyon Road, pay your parking admission ($10 at the time of writing), and park in the southernmost lot you can. You’ll see a small information kiosk, some horse-posts, and a bathroom. Cross the road heading west and you’ll see a well-marked paved road headed toward the backcountry trail system. 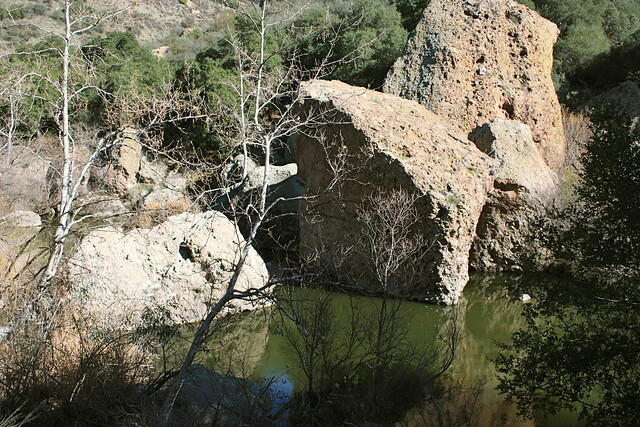 The trail starts off on pavement, and quickly crosses a bridge over Malibu Creek. If the water levels are good, you may see people dipping their toes in the water or splashing around. 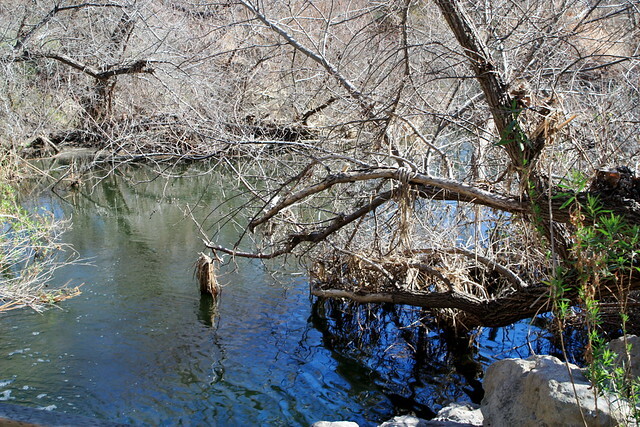 I even saw a few people fishing upstream a bit, although I don’t know if the fishing is any good — the stream seemed a bit shallow in this area. The pavement only lasts for about a tenth of a mile — after that, it’s all fire road and single-track trail. 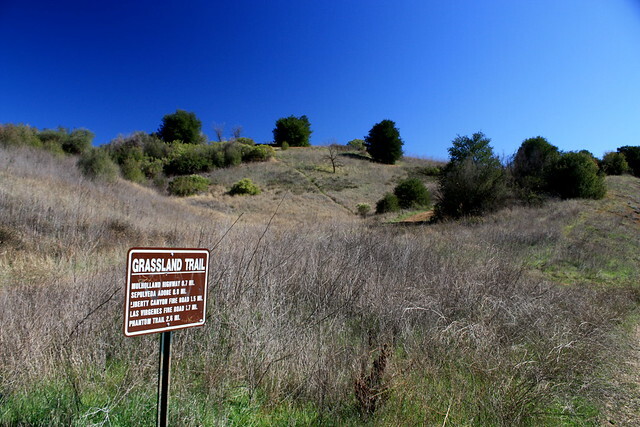 At about the 0.2 mile mark, you’ll come upon the junction with the Grassland Trail, which heads north into the Liberty Canyon Natural Preserve, strolling along some distinctive SoCal grassy hills. Continue on the fire road for another tenth of a mile, where you have the option of boulder-hopping across the creek or veering right onto High Road to keep dry. Hopping across the creek will take you toward the visitor center, but both paths meet up again in a short distance — so take your pick. I chose High Road, which sticks to the north bank of the creek and passes under a few shaded areas. At the 0.9 mile mark, High Road rejoins Crags Road at a noticeable junction. You should be able to see a prominent concrete bridge crossing the creek and heading toward the visitor center from here. Veer right, keeping on Crags Road, as the fire road curves around a ridge and makes the only notable elevation gain of the entire hike. At 1.3 miles, continue past the very steep Lookout Trail — unless you want a nice elevation gain, in which case you can trek up and loop back down the Cage Creek Trail, which meets back up with Crags Road. I’m not sure on the distance this would add, but it looks like it would be around 0.6 miles, versus the 0.3 you’d travel by just staying on the fire road. 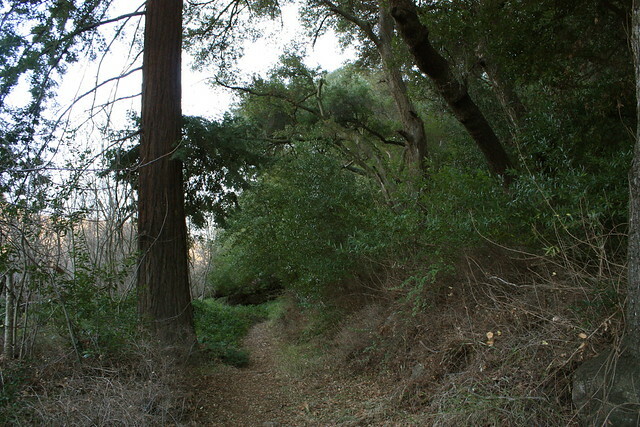 After crossing the creek, ignore the junction with the Forest Trail for now, and continue on the Fire Road. Soon, the road narrows considerably, and eventually turns into a single-track trail over some very rocky terrain. The trail continues in this shaded section between the Goat Buttes, then comes upon the site of the M*A*S*H set at about the 2.4 mile mark, just past a turn-off for a short dead-end Lost Cabin Trail. 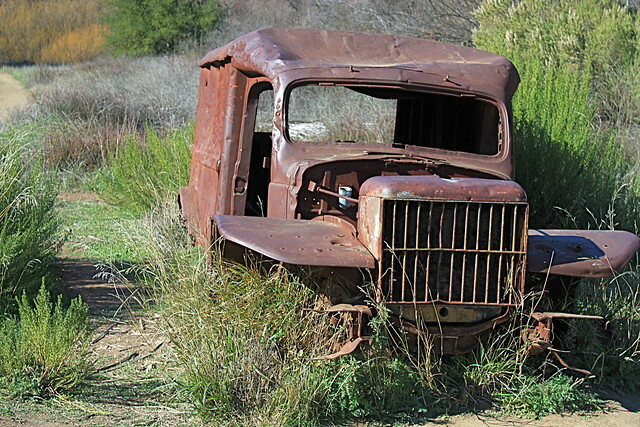 There’s not a whole lot left from the show, but there are two rusted but fairly well preserved vehicles, and a picnic table to sit on if you’re in the mood — it’s got a nice view of the Buttes and the other surrounding peaks. Continue hiking along Crags Road. At 2.7 miles, you’ll reach a junction with Bulldog Road, which switchbacks and climbs up to a ridge on the southern border of the State Park. You can reach a fire road that will take you to Castro Peak (el. 2824), adding about 9.2 miles and 2100 feet of gain, round trip. 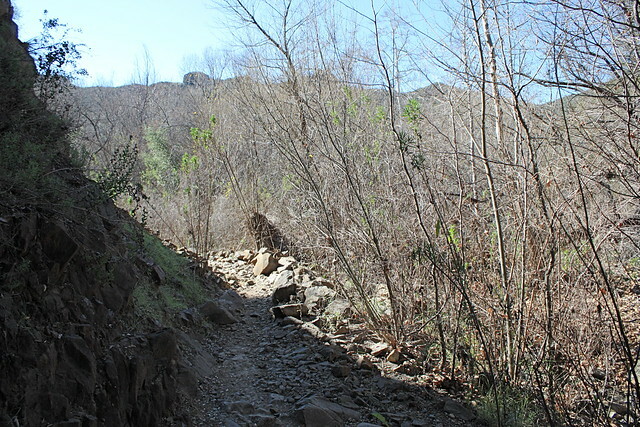 If you don’t feel like turning this into a monster hike, you can veer right at the junction and continue on Crags Road as it turns north, following Malibu Creek. At the 3 mile mark, veer right again to follow the Creek at the junction with another fire road. You’ll notice the water level rise among a pool of giant boulders, which can provide a nice backdrop to a lunching spot or just a quick break. 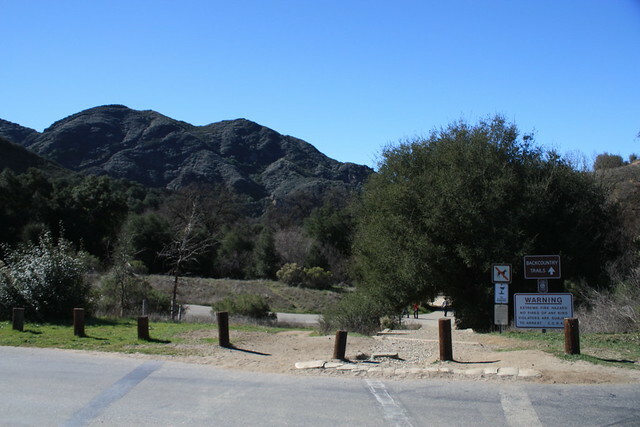 At 3.2 miles, the trail reaches a picnic table and gated dam-bridge, just at the southern end of Malibu Lake. The lake is fenced off with chain-link and barbed wire, as it’s mostly private property around this area. It’s a shame, because a trail around the lake would have been pretty beautiful. There is a small path that appears to cut through some of the brush, but it leads away from the lake, so I didn’t do any exploring. At this point, turn around and head back to the trailhead, or you can explore a few of the shorter, picturesque side trails. At the 4.7 mile mark on the way back, you’ll reach the Forest Trail junction again. It isn’t marked with a sign like many of the other side trails, but it’s a very clear path cut through the grass, just before you cross the bridge over the Creek. The Forest Trail is a short stretch of track that hugs the southern banks of Century Lake, another artificial lake formed by a dam. The trail here is shady and cool, the result of some non-native trees planted here some time ago. The trail is only a half mile to the edge of the dam, where you’ll have to turn around and hike back the way you came. But the views from the dam and the reflections on the lake water are worth the short side-trip. Backtrack to the 6.5 mile mark, back to where you saw the concrete bridge crossing the creek. Standing on the bridge is a great spot to get a clear view of the creek flowing through the canyon, and is worth a stop if you don’t feel like heading to the visitor center itself. One last stop before you head out should be the Rock Pool — a popular area for swimming and rock climbing. Stay on the north bank of the creek and head west along a slightly descending unmarked trail. You’ll pass some large rock walls on the north, which will probably have more than a few climbers strengthening their fingers. At the 6.8 mile mark, the trail ends at the aptly named Rock Pool. Like I said, this is a popular hangout. Even on the cool afternoon I was there, the place was packed with climbers and loungers. 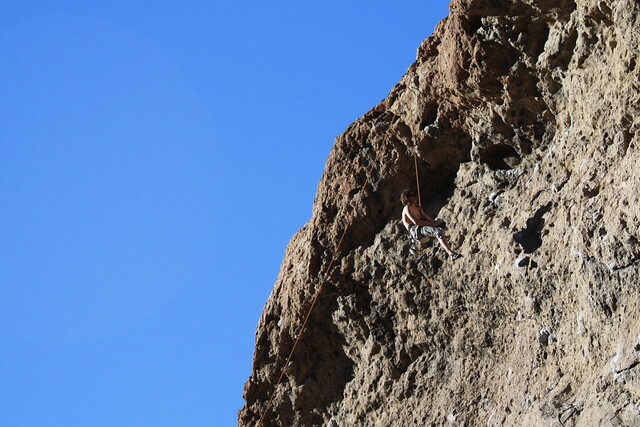 Relax, take a dip, or try your hand at climbing a bit, then return the way you came, back to the trailhead. Very good. Most of the trails are well traveled and very well marked, although a few trails are not marked. You can pick up a trail map for $1 at the ranger stations or visitor center. It may be worthwhile if you plan on doing some side-trail exploration. 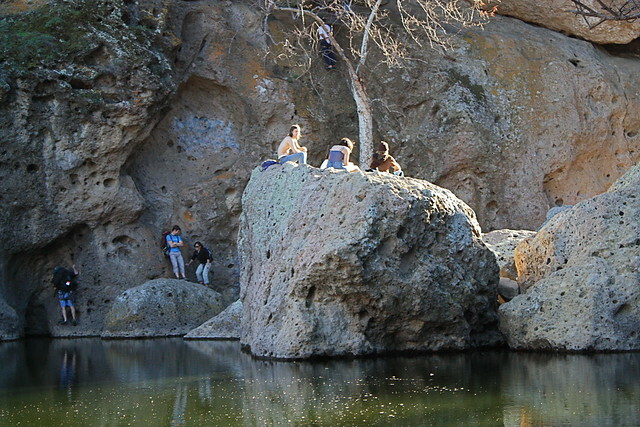 There is developed camping available at Malibu Creek State Park. If you're headed from the South, turn onto Malibu Canyon Road off the PCH and continue 6.1 miles. Turn left into the entrance station. From the North, take the Las Virgenes Road exit from the CA-101 in Calabasas. Continue south on Las Virgenes Road for 3.4 miles and turn right into the entrance station. Parking fee required. Big Storm on Feb 17th, 2017 Washed out 80% of Crags Road, we went on Sunday I think my wife and I were prob the first people or second people to have done the hike since the storm. It was definitely a lot harder to do. Update - parking is $12 and hiking map is $2. 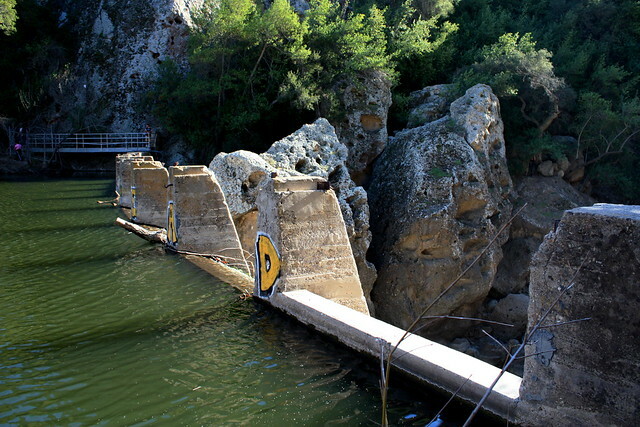 would you know how to get to rindge dam? and if the water is shallow or deep around this time of year? thanks for any help! Love Malibu Creek. $12 is too much. It is a fact of economics that if you make the price too high your revenue will not increase, it will drop. Considering there is so much access where there is free parking, they should drop the price back to $8. I bet their revenue would stay the same or increase.